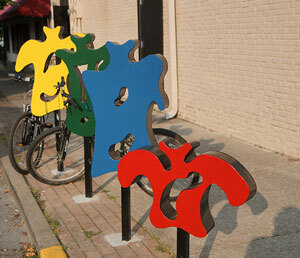 In response to the overwhelming need for new bike racks in the City of Jeffersonville artists that are active in the Jeffersonville Arts Alliance (JAA) have teamed up with students from the Jeffersonville High School welding program to create new and unusual pieces. These racks will be placed in strategic locations in downtown. Five active Artists from the JAA have been paired with five welding students. Each design will be unique and will be a product of the artist’s vision combined with the students’ practical knowledge of what can be built. Funding for the project is being provided by the Clark County Growing Healthy Lives Task Force and the Jeffersonville Urban Enterprise Association. Members of the press and the public are welcome to attend and watch the work progress. The entrance to the welding shop is on the northwest side of the school, along the drive between the school and the Kroger shopping center. There is a large overhead door that opens into the work area.